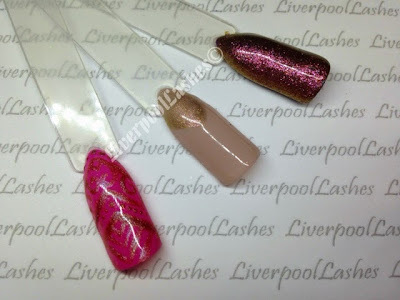 Today I've had a play with some of my Shellac and Additives. To be fair some of them didn't turn out too well which is a shame but I did love three of the Colour pops so I thought I'd share them. From left to right of the photograph below is Hot Pop Pink. 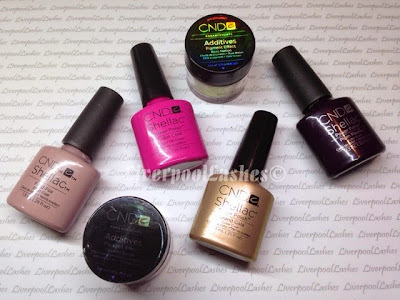 I took CND Additive in Crushed Suede and mixed top coat with it, then using a fine brush to paint a design on, curing and then applying a top coat. The other two are really just to tell about about Colour combinations I'm loving. The middle Colour pop is Field Fox with Grand Gala. Grand Gala hasn't been one that I have used as much as a true gold like Locket Love but the pink tone to it goes perfectly with Field Fox. The other Colour pop gives a mind blowing shade that really has to be seen. It's Plum Paisley with CND Additive in Rose Notion over it. It has an amazing two tone effect that I'm so keen to wear myself. That's it for today's post, to be honest the rest that I did was not up to my standards enough for the blog!